It’s always such a smile-inducing pleasure to come upon a wine that exceeds all expectations in its price class. 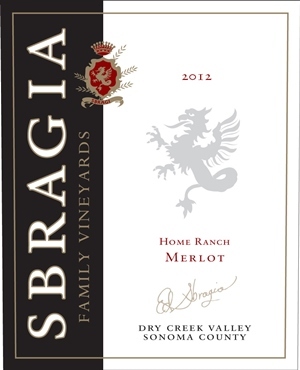 A terrific example is Sbragia Family Vineyards’ Dry Creek Valley Sonoma Home Ranch Merlot 2012, a wine stuffed with the goods to compete well beyond its modest price of $24. And when I say stuffed, I don’t mean simply jammed with a confit of fruit. While this lovely dark red Merlot shows real opulence, its first and lasting impression on the palate is complex: generous body with red fruit flavors supported by lively tannins and bracing acidity. You can’t help connecting this wine’s hints of chocolate with the wines of St.-Emilion on Bordeaux’s right bank. Owner-winemaker Ed Sbragia points out the rocky clay loam component in his vineyards – a telling counterpart to the St.-Emilion clay in which Merlot famously flourishes. In his winemaker’s notes, Sbragia refers to the 2012 Home Ranch Merlot’s “warm, lush flavors of cherry liqueur punctuated with notes of bright red currant and rhubarb,” adding that “the wine has a rich mouth-feel without being a heavyweight.” My sense of it exactly. The more I sipped the Home Ranch Merlot, the more compelling I found it. While it certainly has aging potential, it’s quite irresistible now. In a blind tasting, where not even the grape was known, I suspect Sbragia’s wine would fare very well in more patrician company and that more than a few tasters, conditioned to think of Merlot in pejorative terms, would be astonished at the rewards to be found here. The 2012 Home Ranch isn’t quite unadorned Merlot: There are modest accents of Cabernet Franc (4 percent) and Petit Verdot (1 percent) in the background. This is a winner. Merlot also can deliver savory rewards in a lighter style. 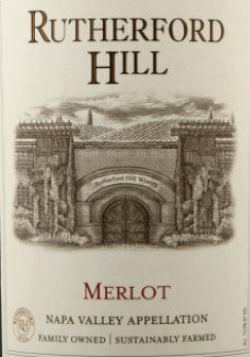 Rutherford Hill’s 2012 Napa Valley Merlot, an attractive value at $18, brings to mind some favorite red Burgundies whose deep flavors belie their pale color and medium body. So it is with this sleeper, which is deceptively light in hue only to awaken on the palate with splashes of red plum and raspberry. Here the blend is 76 percent Merlot with an emphatic 20 percent Cabernet Sauvignon plus dashes of Cabernet Franc, Petit Verdot and Syrah. Merlot is a Rutherford Hill specialty, and this nicely priced wine (not to be confused with the producer’s more ambitious, and considerably more expensive, Merlot Reserve) comes across with plenty of charm for a modest outlay of bucks. This is wine for early drinking, and an ideal accompaniment to weekend picnics. If a looming football game of celebratory stature comes to mind, well, this play could make you the hit of the huddle.